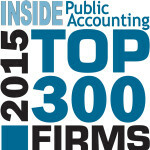 For the first time, INSIDE Public Accounting will rank the nation’s 300 largest accounting firms. The ‘IPA 300,’ the only ranking of its kind, will be unveiled in October. The IPA 300 will complement the annual IPA 100 and 1PA 200 rankings of the largest firms, by net revenue, in the nation. The IPA 300 list will start at No. 201 and end at No. 300. The rankings are drawn from IPA’s annual Survey and Analysis of Firms, which attracts more than 550 firm participants who provide detailed financial and operational information. Some firms will chose not to participate in the survey, but we will work tirelessly to improve upon the IPA 300 rankings to provide the most accurate list possible. We appreciate the cooperation of firm leaders and associations in our effort. Data provided in the survey is also used to create IPA’s annual Benchmarking Report, which serves as a barometer of the overall health, challenges and opportunities of the profession. IPA also names the Best of the Best firms, based on performance in specific areas of management, and is not limited by firm size. As IPA enters its third decade of analyzing and reporting on the profession, we look forward to working with all the firms that have been part of the IPA family over many years. As we continue to grow, we look forward to welcoming new firms, telling their stories, sharing their successes and providing insight to help all firms – and the profession itself – continue to evolve. Contact IPA for participation, if you think your firm may fall into the IPA 300.